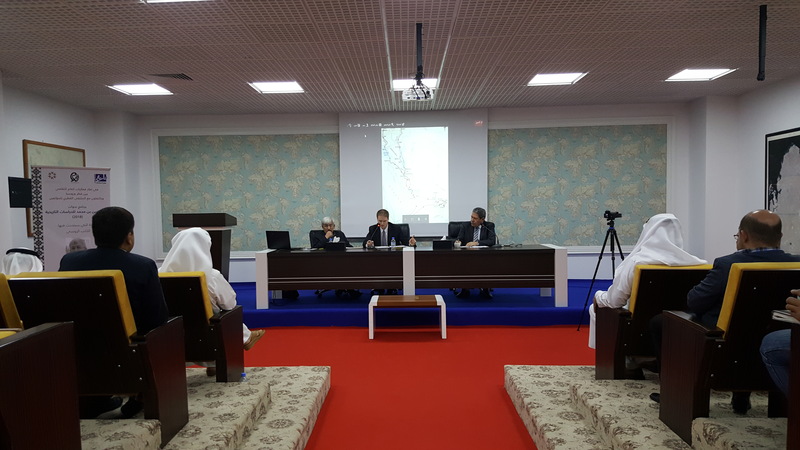 As part of the events of Russian-Qatari cultural year (2018), and in cooperation with Qatar Authors’ Forum, the center organized a seminar, in which the Russian author Sergei Plekhanov delivered a lecture entitled Russian-Qatari Relations...Documents from Russian Archives . He mentioned that the Russian presence in Arabian Gulf preceded the Portuguese and British presence there. He explained that the first Russian to arrive at Arabian Gulf was a merchant named Avinashi Nikitin ; and that there might had been other persons who reached this area, but Nikitin was the first to describe his trips. He visited Hormuz and Bandar Abbas thirty years prior to the arrival of the ships of Vasco da Gama to the Indian Ocean. I do not know whether Nikitin’ s documents were translated into Arabic, but if not, it is right to build on them in order to provide Russian sources about the region. No doubt that the bulk of important information about the history of Qatar can be found in the archives of British and Ottoman Empires. However, Russian sources also can enrich our knowledge of the era of establishing the State of Qatar because Russians have been rivals to the British and the Turks in their struggle for influence in the region. The most dramatic period in the history of struggle between St. Petersburg and London was called A Great Game . Persia was the main area of rivalry, for it was seen as an atrium on the way to India. The Gulf, whether Persian or Arabian, had no less strategic significance; it was the place through which transport routes passed. It was also the focal point that connected the colony with the metropolitan country. London was getting concerned whenever a foreign warship appeared in the basin of that ocean. In the early twentieth century, a regular steamship line was established between Odessa and Basra by Russia. This line was considered as the first constant presence of a European State in a region Britain wanted to dominate. Russia had begun to open consulates along the shores of the Gulf. This suggested that the information received in St. Petersburg did not depend anymore on British and Turkish sources. Hence, documents of the archives of Russian Ministry of Foreign Affairs, of the General Staff, of the Navy and others might help in developing a different view about the events that took place in the 19th and early 20th centuries in the region. The configuration and name of the Russian archives were changed more than once. They were displaced with the capital was moved to Moscow, and they were evacuated during the World War II. For this reason, these archives suffered lack of stability, and many became inaccessible. On the other hand, many records, which were secret before, became thanks to revolutions accessible to researchers quicker than in other countries. The matter, first of all, concerned the documents of the Soviet period. One who is interested in international relations in the Middle East, particularly in the Arabian Peninsula, may study the archives of bodies like the Comintern (Communist International; it existed until 1943) and the foreign department of the Central Committee of the Communist Party of the Soviet Union (existed until 1991). Some materials about Qatar could also be found in the archives of the Russian Embassy in Istanbul and in the consulates of Baghdad and Basra. It is likely that some interesting material may be traced in Tehran Embassy and in the Consulates of Isfahan, Busher and Bander Abbas. It is especially interesting for researchers to get acquainted with materials of the Soviet period that was marked by Marxist ideology. Those materials give an alternative view about many events compared with the western reading of them. Although those writings have become mere historical artifacts, they help in understanding the reasons of political rivalry during the Cold War decades. A number of specialists of different specializations must work together to produce such an edition. In the first place, they are those who can dedicate time and are capable to work in the archives and specialized libraries of Moscow and St. Petersburg as well as in the Institutes of Oriental Studies and Oriental Scripts.